Slot machines are one of the most beloved forms of online entertainment. Along with online poker, online gambling generates nearly $60 billion of revenue annually, and it’s gaining more and more steam every year. The popularity of slot machines isn’t merely an American phenomenon. The excitement and suspense created online by the different types of slot games is contagious. Because of the innate addictiveness of playing the slots, other countries have been giving slots their own unique spin. The Japanese creation, Pachislo, is one of the most popular, unique and underrated slot machine games on the face of the Earth. If you’re playing online casino games and never heard of Pachislo, you’ve been missing out on one of the most entertaining slot machine options available today. Pachislo takes the traditional slot machine design and adds several interesting twists, making the game distinct from any other slot option. The word Pachislo (pronounced: PATCH-ee-slow) is a portmanteau of the words “slots” and “Pachinko.” While Pachinko is one of the most popular games in Japan, the gameplay of Pachislo shares nothing with the game which influenced its name. The unique name is likely the result of the inventors attempting to capitalize on the popularity of Pachinko in order to attract new players. Even though gambling is illegal in Japan, the Japanese people still have an insatiable desire to play the different types of slot games. As a result, Japanese businesses were forced to adapt their slot products to fill the desires of the Japanese people. To circumvent strict gambling laws, the Japanese slot machine accepts tokens instead of coins. Instead of cash payouts, Pachislo awards winners with tokens, which can be exchanged for prizes. The concept is very similar to that of a Chuck E. Cheese or an arcade. Prizes can range from appliances, to electronics, video games, jewelry, clothes, food and even cigarettes. In some cases, tokens can even indirectly be exchanged for cash. Japanese casinos use a loophole in gambling laws to offer “prizes” which are items that can be redeemed for cash at an exchange center located in close proximity to the casino. What Makes the Pachislo Slot Machine Unique? In addition to the game’s reward system, Pachislo offers a slew of unique gameplay features. Perhaps the biggest distinction between traditional slot machines and a Pachislo machine are the stop buttons. Each reel has its own designated stop button, which allows you to control when each reel stops spinning. 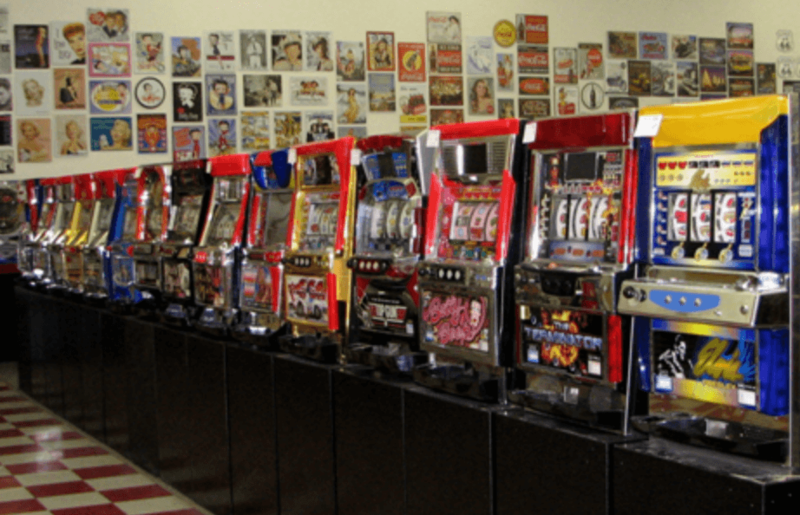 Since the machine operator has so much more control over the game than traditional slot machines, Pachislo players can develop a certain level of skill, instead of relying solely on the pure luck. Even though Pachislo offers the player much more control, each machine has its own quirks, which makes developing the skill much harder. Some Pachislo machines have what appears to be a mind of their own. Since the reels spin so fast, accurately controlling the game is made even harder. While the stop buttons might create the illusion of a simpler game, underestimating the game’s difficulty would be a mistake. Controlling an online Pachislo game is made more difficult since it does not contain actual reels. The stop results are generated using a random number generator, instead of any physical control. The result is that online Pachislo is more reliant on luck then skill. Pachislo machines are typically more interactive than traditional slot machines. Many of them contain flashy anime-style graphics, extremely loud sound effects and some even include a gaming narrative of some sort. Machines with LED screens sometimes display a gaming storyline, which is a drastic departure from their counterparts. Why are Pachislo Slot Machines So Collectible? By law, Japanese casinos can only use each machine for two years. Once the two years have elapsed, the Pachislo machine is either sold off to a collector or transferred to another casino. Pachislo slot machines are much cheaper than other decommissioned slot machines because of their mass availability. Pachislo is a unique take on the traditional slot machine system, relying on tokens rather than coins. Because of Pachislo’s tendency to include pop culture graphics and video game storylines, the game has become one of the most popular slot machine games. If you don’t like to leave your odds up to pure luck, the Pachislo’s stop buttons provide more control, which can become a learned skill with enough practice. If you’ve never taken a Pachislo machine for a spin, give it a try. If you like slots, you’ll like Pachislo.